To learn more about testing titers, including how often to test and why it is often safer and less expensive than revaccinating, read my article about titer testing. Upcoming is a short article sent to me by Biogal, the maker of the new test, the Canine VacciCheck. Test kits are available for dogs, cats and birds. Although most veterinarians agree vaccines are necessary to prevent serious canine and feline infectious diseases, the frequency in which pets are vaccinated is debated. Why does this matter? Although vaccines are largely safe for healthy animals, adverse reactions, both minor and serious, do occur. This is particularly bad when vaccines were given unnecessarily because the animal didn’t need the vaccine in the first place. It is known that dogs, after vaccination, often maintain protective antibody to the important core diseases Canine Hepatitis, Parvovirus and Distemper for three or more years. Blood studies have shown immunity for seven years or more. But how do we know that the antibody levels of our pets through vaccination are adequate? Duration of immunity refers to the length of time an animal is able to resist disease. 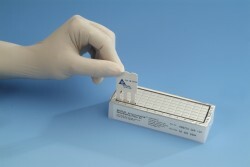 Blood antibody tests can be used to demonstrate the DOI after vaccination for many vaccines, including all the core vaccines. When antibodies are present there should be no need to revaccinate the dog or cat for the specific disease tested. If antibody titer is absent, some vets believe a previously vaccinated dog should be revaccinated unless there is a medical basis for not so doing so. Studies have shown, however, that a dog that has had it’s “puppy shots” is likely immune for many years, even for life. Previously, a significant drawback in performing antibody tests was the cost and the time to obtain results, as it required sending blood or serum to a lab. Consequently, many pets were unnecessarily needlessly vaccinated in the interest of time and money. . Times have changed. The Canine VacciCheck is a rapid, simple, reliable and cost-effective antibody test useful in determining if a dog requires additional vaccination. It can also help determine the vaccination status of a dog with unknown vaccination history or help determine if puppies or kittens have developed immunity from vaccination. What is also unique about the VacciCheck is that it s test provides a simultaneous result developed for all three core vaccines per test, and results are received within 20 minutes. Veterinary clinics and, shelters and therefore have a quick and simple in-office test that can be performed at a reasonable cost to the pet owner. In the past, even though there was an intention by many pet owners and /or veterinarians to carry out titer testing for core vaccines as opposed toinstead of automatically revaccinating, the price of a titer test when compared to a vaccination was often prohibitive. ThereforeAs a result, wWith thea price factor lessened via the use of the VacciCheck, veterinarians can send ‘annual health check’ reminders instead of Vaccination reminder cards for vaccines. The ‘annual health check’ moves the emphasis from, and client expectation of, annual revaccination, thus saving the client money and eliminating adverse reactions from unnecessary vaccination. Read what world renowned canine vaccination expert Dr. Ron Schultz wrote about this product. I am so delighted to hear this news! Titer testing is even more complicated and expensive since I live outside the US. I have sent my vet this information and will encourage her to try it. As I’ve posted elsewhere on this site, my little dog had a vaccine reaction in 2007, was titer tested in 2010 and needs no further re-vaccination. Well worth it! Thanks so much, Jan.
Can you tell me how to order this in-house titre, or how my vet can order it? thank you. I just contacted the county dog control where I live and they have told me that they will now accept a titer test in lieu of a rabies vaccination for re-license on my dog. Lori, really? If so, it will be a first. Please report what they told you. Is it for cats AND dogs? If you have a phone # or email address, please let me know. At least, we’ll need a city/county/state. This could be big!